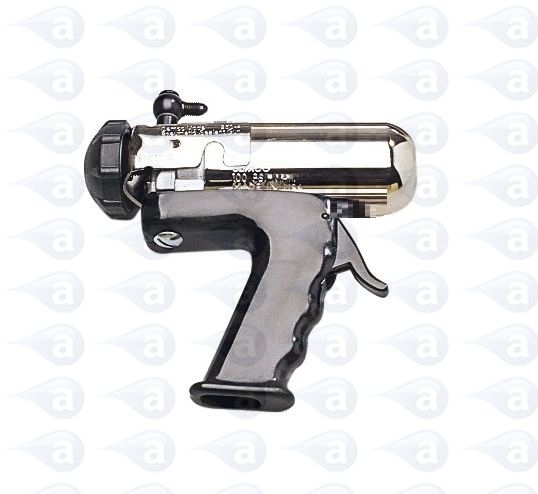 A pneumatic metal cartridge gun with quick attach bayonet retainer and quick shut off to reduce drips. Suits 2.5oz (75cc) cartridges. Suited to controlled lines or potting of most adhesives, fluids, sealants, RTV, grease, gels, long cure or single part epoxies, mastics and potting compounds. Connect an air line to the applicator or use optional hoses. Undo the end cap and remove the retainer. Load in a 2.5oz cartridge. Replace the retainer and screw tightly to secure the cartridge. Attach a threaded nozzle or use a male luer lock adapter with any standard needle tips. Press trigger for flow and adjust your regulator or mains air supply for control.